Bayern achieved a brilliant comeback in one of the best Champions League knockout games for many years. Pep Guardiola was without Arjen Robben, so Douglas Costa switched to the right flank with Franck Ribery playing on the left. Xabi Alonso started in the holding role rather than Thiago, while Mehdi Benatia was at centre-back, with David Alaba on the left and Juan Bernat on the bench. Max Allegri had major injury problems, without Claudio Marchisio and Paulo Dybala from the XI which started the first leg, and Giorgio Chiellini still out too. Alvaro Morata played upfront instead of Dybala, and Hernanes started in place of Marchisio – but the real point of interest was Juve’s overall system. Juventus shifted between two completely different formations throughout the first half, and the two systems had entirely different purposes. In the opening stages, Juve pressed Bayern high up the pitch. When the Italian champions were doing this, their system was 4-4-1-1, with Paul Pogba in the number ten role pushing forward to press the centre-backs alongside Morata, the wide players pressing the Bayern full-backs, and Hernanes and Sami Khedira pressuring Alonso and Arturo Vidal. It almost felt like 4-4-2 against 4-4-2 at times, every player having a particular opponent to close down. Through this pressure, Juventus caused serious problems. Manuel Neuer had an unusually poor game and made two mistakes in the opening half hour, committing an error when sweeping which allowed Paul Pogba an open goal for 0-1, then (and more significantly in terms of the tactical battle), playing a dreadful pass when under pressure which resulted in Morata lofting the ball into the net, a ‘goal’ which was disallowed for an extremely tight offside decision. The Bayern centre-backs looked nervous throughout and Alonso, never the most comfortable when pressed heavily, was unable to put Bayern in control. Immediately after going 0-1 ahead, Juve stood off Bayern for the first time. And now it was clear they were using a different system entirely – a 5-4-1. Patrice Evra tucked inside, Alex Sandro dropped back to become a wing-back, and Paul Pogba defended the left flank. The positions of his tackles and chances created shows Pogba was playing mainly on the left. This wasn’t a permanent shift, it was simply how Juventus were playing without the ball. If, when they pressed high up, Bayern played around the press and entered the opposition half, Juve’s system would evolve from the 4-4-1-1 to the 5-4-1. The ‘movement’ usually happened to the left, although they were capable of doing something similar on the right, because Cuadrado has experience of playing as a wing-back. He and Stephan Lichtsteiner acted as a great duo, with the former making forward runs (often in very narrow positions for a full-back) including the run that caused Bayern problems for the opener. In general, Juve built play down the left, then spread the ball right to runners in space. The 5-4-1 meant Juve had a spare man at the back against (essentially) two forwards, Robert Lewandowski and Thomas Muller. The only thing that caused them real problems in the first half was when Vidal made storming runs in advance of Bayern’s two forwards – he got in behind once from a good Costa pass, and then nearly did something similar later on. It was basically a simple numbers game: 3 v 2 and Juve looked fine, but 3 v 3 and they had problems. Because Vidal was almost playing like a half-forward, though, it meant Bayern lacked control of the midfield zone, and were also prone to counter-attacking runs through the centre of the pitch. It’s tough to explain quite how impressive Juve’s system was throughout the first half. 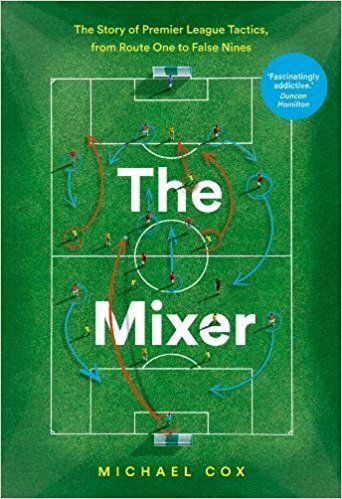 They were simultaneously perfecting a high-pressing approach (winning the ball high and shooting immediately) and a deep block (winning the ball deep and breaking swiftly on the counter-attack). This counter-attacking threat became more obvious as the first half continued, and the second goal owed much to brilliant work from Morata, who collected the ball deep, beat three players and then played a pass right to Cuadrado, completely unmarked, who converted coolly. Interestingly, this was the first time Alaba had drifted inside into a central position from his left-back slot (movement he makes more regularly in other Bayern games), and Bayern were immediately punished, with Cuadrado left free. Guardiola’s half-time team talk was the most important of his career. He hasn’t won the European Cup with Bayern – despite taking charge of the reigning champions in 2013 – and falling at the second round stage in his final season would have been regarded as a serious failure. First, Guardiola returned to the back four he used in the first half – the hapless Benatia sacrificed, Alaba moving inside into central defence, and Bernat on down the left flank. The Spaniard made a series of very good runs at the start of the second period, and Alaba theoretically had the speed to cope with Morata. “Theoretically” is key here, because Morata continued to cause problems with some fantastic solo runs. He beat Alaba easily in the inside-left channel before running out of steam as he attempted a shot, and then a clever Pogba through-ball released him again in that channel. Juve were now concentrating on defence, but Morata’s ability to contain Alonso, before storming forward to attack the two centre-backs, was absolutely crucial to their gameplan. Bayern hadn’t really improved since half-time, and needed two goals, so Guardiola made an extremely attacking shift after an hour. Alonso was sacrificed and Kingley Coman – who recorded three assists in the weekend win over Werder Bremen – was introduced. Vidal now dropped into the holding role, Coman was deployed on the right, and Costa moved inside into a roaming central role, from where he was Bayern’s best player. The decisive change, however, was from Allegri. He clearly judged Morata to be exhausted after 72 minutes, and replaced him with former Bayern forward Mario Mandzukic. The Croatian striker is an entirely different beast, someone who plays well with his back to goal, but entirely unable to make bursts into the channels like Morata. Now, Juve had absolutely no counter-attacking threat from upfront, while Pogba, Khedira and Cuadrado all tired. It was notable that Allegri replaced Khedira and Cuadrado with Stefano Sturaro and Roberto Pereyra, two simple, up-and-down runners who could burst forward into attack when needed, presumably hoping they would combine with Mandzukic’s hold-up play. It didn’t work, however, and Juve were simply defending for the final 20 minutes. Meanwhile, a minute after Mandzukic’s introduction, Bayern got back in the game. Costa, drifting right from a central area, created a 2 v 1 with Coman down the right, and fired in a brilliant cross which Lewandowski headed home at the far post. Bayern were suddenly dominant down that right flank, with Juve now permanently 5-4-1, because they were always defending. Evra tucked inside, Pogba wasn’t able to assist Sandro closely, and now the Brazilian wing-back was overrun. Having been unable to get the ball into the final 20 yards of the pitch in the first half, Bayern made inroads down the right flank. Bayern continued to threaten down this flank. Costa played another brilliant cross which Lewandowski nodded onto the far post – although he was offside. Then, as the clock ticked into stoppage time, it was Coman’s turn to fire in a deep cross from the right, converted by Muller. It’s difficult to know which was more surprising: Guardiola depending on a crossing-based approach, or this fine Juventus defence undone by such an approach. Either way, it was 2-2, and extra-time. In a tie of incredible swings, Muller’s goal felt like more than just an equaliser. Juve were minutes away from progressing, but from the outset in extra-time there was only one side who seemed likely to win: Bayern had the momentum, they looked fresher, and now Juve were extremely nervous defending deep and unable to get out. Guardiola’s final substitution proved crucial. Thiago was introduced in place of Ribery, with Costa going left, and this added invention from between the lines proved crucial. It was slightly surprising Thiago wasn’t summoned earlier, as Bayern lacked any kind of creativity in central midfield for long periods. Nevertheless, his renewed energy was vital: he scored the crucial goal, to make it 3-2, because he reacted first to a loose ball on the edge of the box, played a one-two with Muller, and converted excellently. 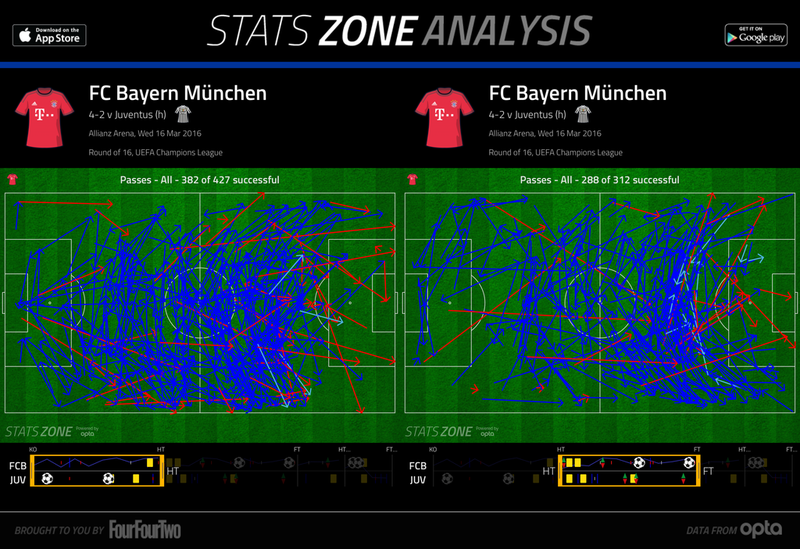 It was the type of rapid passing football in tight positions Bayern had previously been lacking. Coman was the man to finish it all, storming down the right before curling the ball past Gigi Buffon. That was fitting, considering Bayern had made inroads down the right after his introduction – and also somehow inevitable, considering he’s currently on loan at Bayern from Juventus. This was a simply outstanding tie which featured ludicrous aggregate swings (Bayern 2-0 Juve, Bayern 2-4 Juve, Bayern 6-4 Juve), but was also a fascinating game tactically, between two managers who create extremely well-organised teams, but are also unafraid to try new things. There was so much interesting in a tactical sense here: ‘tactics’ gets a bad reputation because tight, cagey matches are charitably described as ‘tactical’ by commentators – but this was the most interesting tactical game you’ll see all season, and possibly the best game of the season too. Both managers deserve great credit. Juve’s system for the opening hour was absolutely brilliant: two systems, two different approaches for stopping Bayern, both completely effective. They clearly ran out of steam, though – if Allegri had a proper Morata replacement, they probably would have won this tie. Guardiola didn’t do anything particularly wrong in the first half – it was more Allegri and Juve’s brilliance. But he nevertheless got Bayern back into the tie steadily, and the two attacking substitutes, Coman and Thiago, both proved crucial as Bayern ran away with the game. Best game of the season indeed. Juventus’ first half is probably the best tactical performance a team can make in a half. Sandro particularly impressed me in the “tornante” role, although he always had Pogba’s great assistance. Pogba’s overall performance was perhaps the best midfielder performance in Europe the whole season, a real seminar of what a modern midfielder should do. The “2012 Ramires vs Barcelona” role taken onto another level. But the bench decided the game. The difference of the two teams is that Bayern can effectively play the same with anyone of its players on the field. Juve can’t. Sturaro, Pereyra and Mandzukic are good, but this game required extremely high mental and physical capabilities. 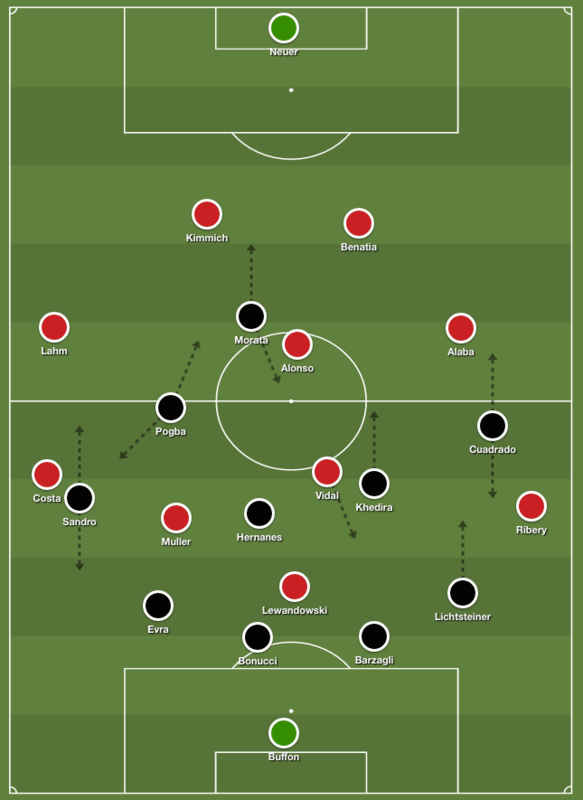 Cuadrado’s runs were crucial for Khedira not being put under heavy pressure, Khedira not being put under heavy pressure was crucial for Pogba finding space on the left, Pogba finding space on the left was crucial for Sandro not being overran, etc. This midfield was the epitome of a cohesive unit, but Juve didn’t have many alternatives in the bench (not even a third CB). One change and the whole midfield solidity cracked. Bayern, on the other hand, looked even more dynamic with Pep’s changes. From Lewandowski’s goal moment, it looked inevitable that the equaliser was to come sooner or later. And something for the end. There is no such thing as a “cross” in Bayern’s game. There are only high-passes. They are extremely well placed. Pep gets the credit for that, as it’s something we weren’t seeing in Barcelona. The interesting thing is, he did have a replacement, Simone Zaza. He may not be as comfortable technically as Morata but he is as quick and dangerous in open space. It’s simply shocking that Allegri opted for Mandzukic over Zaza in that situation, especially considering the Croatian was carrying an injury. 100% correct. Where the hell was Zaza was the first thing I said when that sub was made. I can’t help but think Allegri should have had Costa man-marked, by Mandzukic, during the last 15 minutes of the 2nd half. His growing threat was unmistakable, and with Sandro and Pobga unable to cope it would have been worth sacrificing Mandzukic. 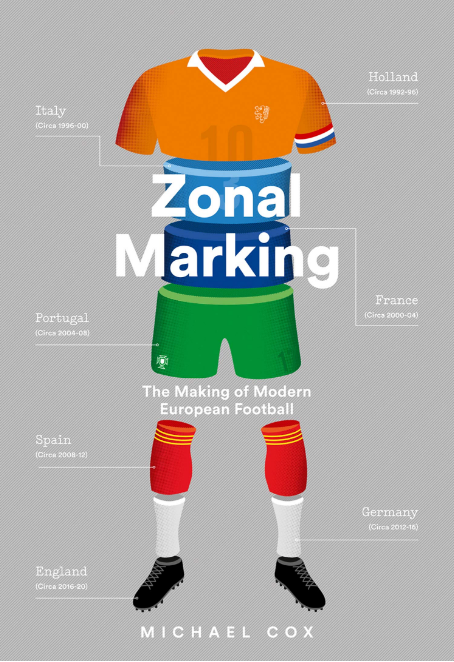 Great article and fantastic analysis, thank you ZM and Michael Cox. One of the best UCL ties in recent years, Absolutely riveting. Two world class coaches battling it out tactically and one substitution bundle cost Juve the match. They’re so unlucky, Nobody gave them a chance at the Allianz arena, Still Juve were just minutes away from going through.Morata played the game of his life with some stunning solo runs with immense pace.Pep somehow survived and you never know, This might be the his season. all in all, It was a terrific match and I felt really bad for Bianconeri. They’re so unlucky. Great analysis. Just one minor thing that was missed. In extra time because Juve’s transition were so poor Perreyra moved to the centre of the pitch as a number 10. I believe Guardiola subbed Thiago in as a direct response to that tactical switch as Thiago ultimately found space when the Juve diamond 4 which was a flat 4 got caught disorganised outside the box. I just can’t believe we managed to stuff this up. Allegri trusted our defensive structure too much. Barzagli was amazing. Bonucci good too but not as comfortable in the air as Chiellini would have been. The only time I’ve ever seen a team completely defend the way we tried was Inter’s Mourinho in that famous second leg. They still conceded 1 (admittedly with 10 men) but held out Barca in the end. A truly special performance, as much as I hate them. My point being you always need some form of attacking threat even when primarily defending. When Mandzukic sat so deep it forced us to play though the lines rather than over or around them. This is where we got stuck in the first half of the first leg (Allegri should have realised this). I think this really demonstrated how special Atletico have been when you think of the type of transitions they would commence with some slick passing under heavy pressure from the likes of Arda and Koke. I remember a couple of times they destroyed Barca in that manner, even then they still had Costa sprinting forward from deep. We weren’t able to do this, especially with Sturaro and Perreyra, but we struggled in the first leg like this anyway and when we lost the ball it just allowed Bayern to essentially counter our counters, which is an underrated strength of Pep’s teams. Allegri has brought a lot to my team. People weren’t happy when he joined after Conte’s departure, but to be honest, as much as I love Conte, he is very pigheaded. In the final months of his tenure he kept talking about how Juve need better players in Europe (rather than considering the deficiencies in his game plan) as well as the fact that Juve can’t compete because we don’t have the revenue of the big 3. Conte was good for Serie A where teams defend against us, Importantly Allegri has further harnessed those methods but also brought us a European mentality to a point where we are one of the best teams in the world now without the ball, as well as now being a genuine counter-attacking team when need be. Allegri has my utmost faith for the work he has done in these 2 years. He is doing for us what Capello did after Sacchi, but it took Sacchi and Conte to bring these big clubs back from the depths with a forceful philosophy which was implemented stringently. Unfortunately Allegri made mistakes. I said it after the first leg, that he completeley misunderstood the attributes his strikers can provide in varying situations of a game. Zaza would have been perfect for Morata!!!!!!!! I am certain we would have got another goal ala Torres v Barca in 2012. When will our European Cup come!!!!!!!!!!! I have to be honest, when I saw the 4-5-1 on paper before the beginning of the match, I didn’t give Juve any chance. Without Marchisio, Dybala and Chiellini it was hard to see Juve being able to have enough quality to play the ball. What I saw Alex Sandro, Pogba and Morata do was fantastic. There was one defensive run of Pogba who chased Ribery back until his own area and steal the ball. I wonder how much we paid all this “double positions” at the end where everyone on the pitch was interpreting two roles at once. Anyway, it made me really proud of this team, it hurts and feels dull to leave the Champions League two minutes before advancing, but I cannot help smiling at the overall performance and at Guardiola’s face after Cuadrado second goal. He was completely blown away. First goal gave Bayren strength for that comeback. Until that first goal Juve were very stron at the back and I just couldn’t see Bayren scoring. It was great game for the supporters.